This is a press-release for our new paper – Wave breaking patterns control rip current flow regimes and surf zone retention, which can be accessed here. Research by the Universities of Southampton and Plymouth has found a new link between breaking waves and the hazard posed by rip currents. The research provides a better understanding why some surf zone conditions are more hazardous than others and could result in more lives being saved. Researchers Dr Ivan Haigh (left) and Dr Cristos Mitsis deploying GPS drifters. Hazardous rip currents are features on many beaches worldwide, and are thought to account for 68 per cent of rescue events involving the Royal National Lifeboat Institution’s beach lifeguards in the UK. The study, which also involved researchers from Macquarie University (Sydney, AUS), and Deltares (Netherlands), used a combination of video imagery and in-situ rip current measurements at Perranporth Beach in Cornwall, which is well known for experiencing dangerous rips. 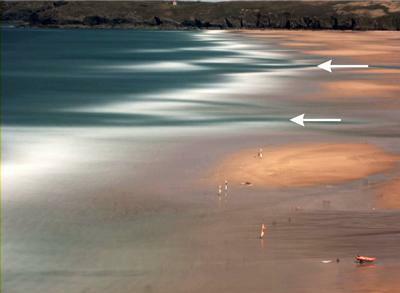 The researchers found that when waves break across the end of a rip channel, it in effect closes the channel and stops the currents from travelling far offshore. Crucially, however, they found that the absence of breaking waves across the channel promotes the formation of a much more hazardous rip current that can extend far offshore. 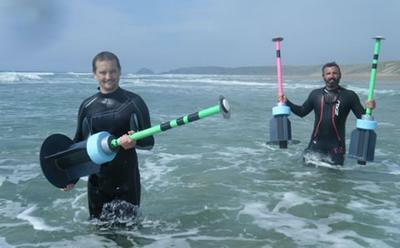 This is the latest research into rip currents involving the University of Plymouth, with previous work having focussed on combining GPS drifter data with information recorded using current meters and water level sensors. This study builds on existing research between Plymouth and the RNLI and, for the first time, uses images captured at the beach to provide a comprehensive picture of the threats posed by rip currents. I am advertising a new PhD project – click here for details. Please contact me if you are interested or apply here. I am the co-director (together with Robert Nicholls) and admissions officer of the MSc Engineering in the Coastal Environment. This programe is uniquely provided jointly by academics from the Faculty of Engineering and the Environment, based at Highfield Campus and Ocean and Earth Science, based at the National Oceanography Centre. The programme is strongly linked to industry and focussed on applied issues in the coastal zone. The overall goal is to educate technically-orientated coastal practitioners for suitable employment in coastal engineering, both in consultancies and relevant areas of government. I am pleased to say we have just launched a new blog with details about the course and interviews with past and present students. Our current students are finishing off their research projects. Our next intake start the last week in September 2013. I want to wish Bryce Corlett all the best as he moves back to the USA to start a PhD at Wood’s Hole. 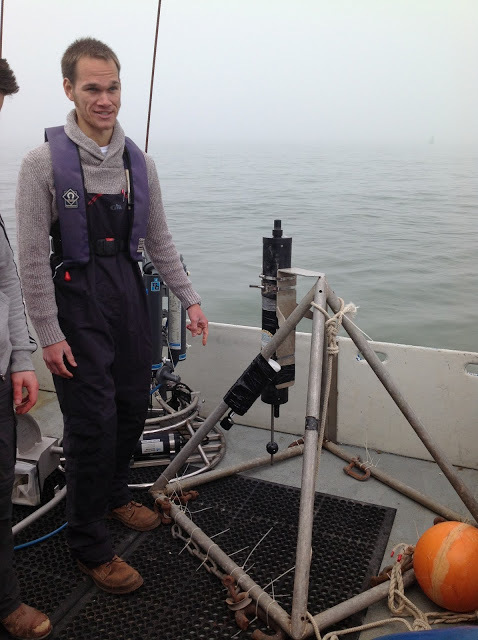 Bryce has spent a year at the NOC undertaking the Engineering in the Coastal Environment MSc that I co-direct with Prof Robert Nicholls and Carl Amos. Byrce undertook his research project with me, looking at relative sea level trends and vertical land movements around the UK. We are in the process of writing that work up as a journal paper. All the best with this next stage of your life! During my PhD I digitised Historical sea level data, extending the Southampton record back to 1935. This web-site details other efforts to rescue historic data – http://historicsealevel.wordpress.com. I’ll be giving an invited talk at this conference in Sep 2013: http://www.uni-siegen.de/evan2013/. Should be good!